Welcome to Suman Sinages. Manufacturer & Supplier of Labels, Stickers, Sinages, Mimic, Name Plates & Layout. The company was incepted in 2009, at Mumbai. Our products are applicable in advertising & promotion sectors. Customization, timeliness & Cutting edge technology make us the first choice of our clients. We offer a wide assortment of Industrial Labels, Commercial Signs & Name Plates. Our Industrial Labels & Custom Stickers are best in the industry amongst others. 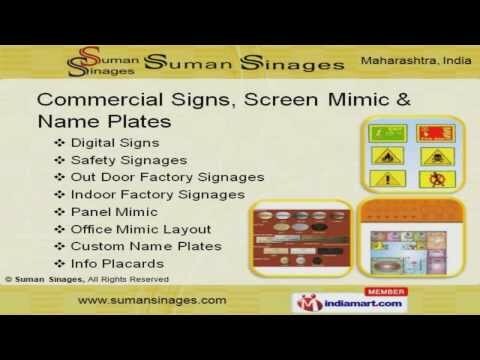 Commercial Signs, Screen Mimic & Name Plates offered by us are highly demanded in the market. Our Night Glow Signages & Boards and Plant Layout Boards are available at industry leading prices. We also provide Domed Stickers & Domed Labels and Awning Motors that are some of our best selling products. Along with that we offer Motorised Gates, Rolling Shutters and Barrier & Gates that are a class apart.